1WHAT IS IMPORT REVOLUTION SLIDER? In our stunning WordPress themes, relevant demo contents are provided with individual themes. You get the demo files inside the theme package. It should be noted that the demo images and texts are not permitted/supposed to be used on commercial/live sites. You can just use them for gathering an idea of how to well-organize your site. 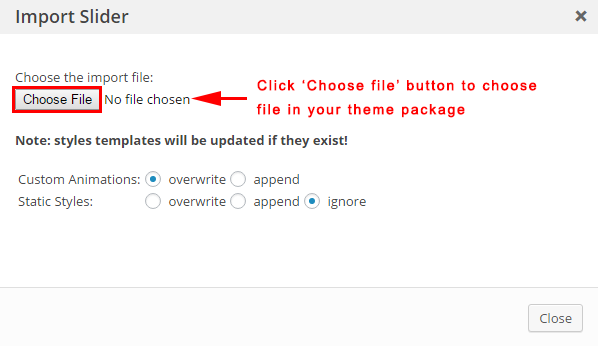 After installing and activating the theme, it will prompt to install dependency plugins. Please install those plugins and activate. Now you are ready to start importing demo contents. In this article, you will find how to Import Revolution Slider. Before the installation, please pay attention to some settings related to your host server. If there is any problem related to these values, you should contact your host to get support. 3HOW TO IMPORT REVOLUTION SLIDER? Follow these steps for manual importing Revolution Slider. Step 1 – In the Administrator page, please go to Revolution Slider >> Revolution Slider and click Import Slider button. Step 3 – In the window, please choose the revolution slider file in the data/revslider folder (for example, home1.zip file) and then click on “Import Slider“ button.